The Florida Democratic Party leaders have breathed new life into that old carcass that was Charlie Crist’s political career, and they expect the rest of us to fall in line. For Hispanics, Democrat Leaders, and Republican Leaders for that matter, are willing to do just about anything to secure their vote. Getting in-state tuition for undocumented college students was a major coup on the vote trail. For African-Americans, not so much. I’ve already gone into the fact that people EXPECT Black People to vote for ANY Democrat, and therefore don’t feel the need to TRULY address issues affecting our community. Charlie Crist opening an office in Liberty City was his way of throwing African-Americans in Miami-Dade county a fish fry and calling it a day. I continue to get harassed by those “democrats” on twitter regarding the fact that I will not, and will continue to encourage others not to, vote for Charlie Crist, no matter what. I get the usual spiel about not voting for Crist is a vote for Scott, and do I want four more years of Rick Scott. Newsflash folks: Black people have suffered far worse, for far longer, than Rick Scott, so that guilt trip doesn’t work. As Glinda the good which said in The Wizard Of Oz: begone! You have no power here. Stevie Wonder and Ray Charles can see that Charlie Crist is taking advantage of the desperation of the party. Im so tired of hearing: hold your nose and vote for him. Why should I have to hold my nose to vote for anyone? I don’t, and I won’t. I’m going to vote in the primary for Nan Rich, and I’m hoping enough Floridians do so to make her the nominee. She can be trusted. We know where she stands. We know who she has supported her entire political career. The same ones who now want to throw her under the bus. I won’t participate in that. Not for anyone, and certainly not for Charlie Crist. The Democratic Party won’t mention the allegations that Crist sold Judgeships. The hypocrisy is amazing to me. The fact that a lot of people want a blind eye turned towards Crist’s flip-flops is amazing to me. Some Democrats are really acting like Crist is the second coming of CHRIST. Well he isn’t. He is the second coming of CRIST. Charlie Crist has proven time and time again that he is willing to morph into anyone if he thinks that will get him elected. That is a very dangerous person to everyone, but especially to African-Americans in Florida. Has he been to more churches yet? Has he commiserated on the sad state of affairs of the African-American community yet? Has he talked about what “needs” to be done? If not, it’s coming. He won’t do a darn thing about it though. It’s all talk. For votes. We all know that nothing will be done for our community. Undocumented college students can now pay in-state tuition, solely for the Hispanic vote. Young Black men are still getting gunned down by virtue of “stand your ground”. Don’t be fooled, Black people. Don’t be fooled. 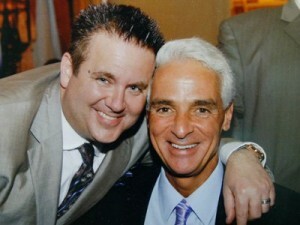 I know that we love The Lord, but Charlie Crist is not our savior. He isn’t anyone’s savior. Well, except for Charlie Crist.